Wow! I did the Advocare 10 Day Cleanse. I thought I would share what I learned. How I handled it and what my results were. I have been blogging about the Advocare 24 day challenge. I know you have been following Karla’s Advocare journey. She got the jump start she needed to lose weight by starting with Advocare 10 Day Cleanse. Check out Karla’s latest good weight loss tips below. 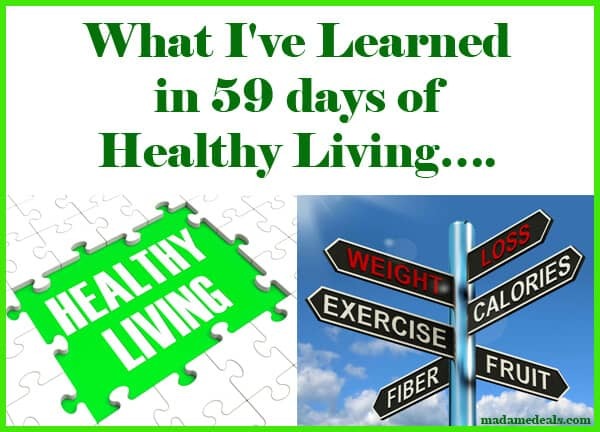 What I’ve Learned in 59 days of Healthy Living…. As I sat down to write this week’s article for Wellness Wednesday I found myself chuckling. In just a few months my life has taken a major turn from a life of stuffing my body with junk, no exercise, aching joints and a sluggish spirit to a life of healthy eating, daily exercise that fills not only my body but my spirit with energy. What a difference a couple of months make. In recognition of my 59 day journey to health and well-being I share with you the top ten things I have learned along the way. Nobody is looking at you when you are at the gym. It’s totally okay that you look gross. Everybody looks gross; if they don’t then they are not working hard enough. Vegetables really do taste good without butter or cheese sauce; even Brussels sprouts. You can enhance the flavor of vegetables with spices and a drizzle of olive oil. Experiment with various combinations to create your own recipe. I have not consumed white refined sugar or sugary foods/drinks in 59 days. Natural sugar found in fresh fruits and vegetables is all your body really needs. It is possible to go to bed and sleep without a bedtime snack. By eating meals on a regular basis you should not have to eat a bedtime snack. If you feel the need to do so make wise food choices that will digest easily and not sabotage your good daytime food choices. Your body will begin to crave exercise and healthy food. Healthy food choices will begin to fuel your body with the positive energy it requires to function efficiently. The exercise is exhilarating and eliminates the effects of stress and anxiety. It is possible to drink at least 8 bottles of water per day. By incorporating more water into your diet and exercise program your body will begin to flush out the toxins and be replenished. By using a water bottle with measurements imprinted on it you will be able to track your water consumption easily. You may find, like me, that you will actually consume more water when you eliminate other drinks such as soda. Fuel your body with whole grains, fresh fruit, low-fat dairy and lean protein. I find that a fruit smoothie made with frozen berries and melons mixed with a banana and un-sweetened fruit juice fills me up and keeps me going. Frozen breakfast biscuits and corn dogs (yes corn dogs) are not necessary for breakfast. Starting your day with the right breakfast will set you on the right track for your day. You must get rid of clothes as you grow out of them. By keeping them you are merely giving yourself permission to fall back into them at a later date. A few new clothing items along the way is a great treat and will allow you to see your body take on its new shape. Declining invitations to certain social events may be necessary until you get a handle on your new way of life. If you have to attend a function, such as a dinner meeting, it is a good idea to eat a light meal of healthy food choices and eat a small amount at the function. Set small goals instead of one big one. I have found that success is sweeter when you allow yourself to reach smaller goals than if you work toward one big one. And if by chance you don’t meet a small goal allows yourself grace and continue working toward it until you succeed. Never give up even if you stumble. The work will be so worth the results. Karla – Taking Back My Life Advocare 24 Day Challenge journey!